Unlike with other so-called Elliott Wave software products, what you get with ELWAVE® is the real deal: a thorough Elliott Wave analysis. ELWAVE's analysis engine uses a model that includes the whole of Elliott Wave theory, including essential aspects such as the fractal nature of Elliott Wave, without simplifications or shotcuts, thereby offering you the full power of this method. In addition, ELWAVE's analysis is always consistent, objective and unbiased. As complicated as Elliott Wave Theory may be, using ELWAVE® is simple. Here's why. Many traders who try to use Elliott Wave in their trading focus on finding the one best wave count and base their trades upon this supposedly only correct analysis. In reality there is almost always more than just one valid wave count. Instead of obsessing about which of these is the best or 'right' one, ELWAVE® keeps track of all valid wave counts for you and gives you clear signals based on their degree of consensus. This is the best way to find good trading opportunities using Elliott Wave Theory and ELWAVE® is the only software that can do this. What this means is that you don't have to bother yourself so much with the actual wave counts themselves. Just take a look at the Summary Inspector and the Target Clusters and you will get an instant feel of what the market is doing and where it's going. Read on to find out how this works. The basis for all of ELWAVE's analytical power is formed by the Elliott Wave analysis engine contained in the Automatic module. The Automatic module generates multiple wave counts, labels the chart and draws trendlines, target levels and exit levels. 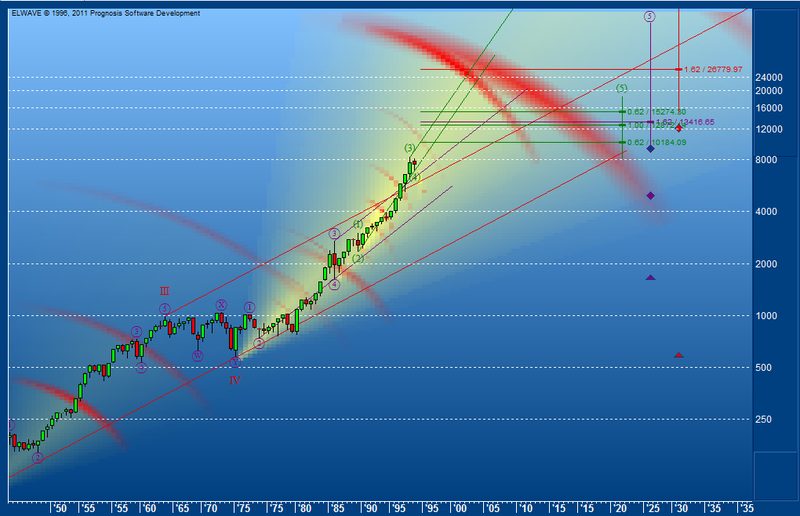 In short a complete, Elliott Wave based analysis of your chart. 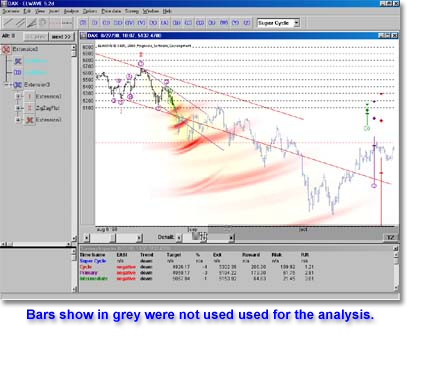 The analysis done in the background so you can continue working with your charts while ELWAVE completes its analyses. With this information you can easily decide whether or not a trade makes sense for you. Even if you don't know anything about Elliott Wave you will quickly learn how to use this information to your advantage. The information in the Summary can also be used to scan an entire universe of symbols to look for opportunities to trade; more on that in the section entitled Scanning and real-time monitoring below. For traders that want even more guidance there is a final cherry on the pie: the Expert Advisor. This will tell you in plain English how to interpret the analysis results and whether there is an opportunity to make a trade. 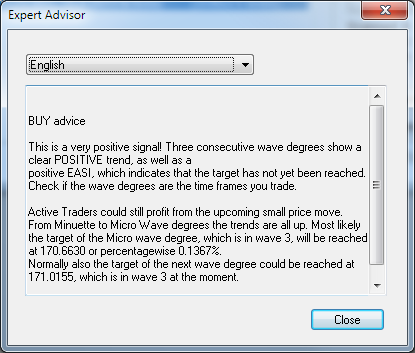 The Expert Advisor allows anyone to take advantage of the power of Elliott Wave analysis, even if you don't know anything about Elliott Wave Theory. By contrast, for Elliott Wave experts the Wave Tree and Wave Inspector offer a unique insight into the heart of the Elliott Wave analysis performed by ELWAVE. 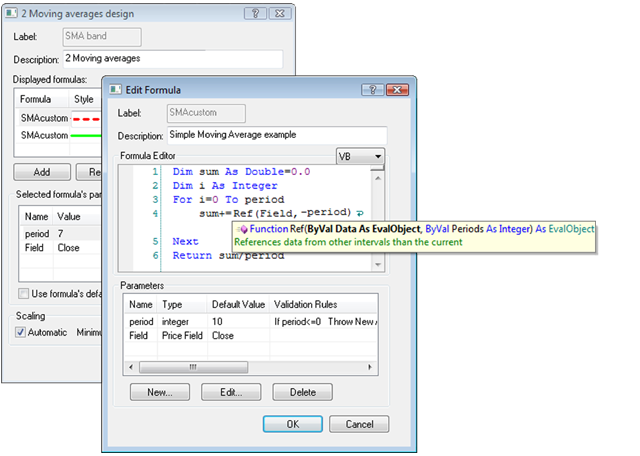 You can explore every detail of the analysis and view the complete set of rules and guidelines that have been checked for each individual subwave. You can even create your own wave count either from scratch or using the automatically generated wave count as a basis and let ELWAVE check your count for mistakes or inconsistencies. Again, this is for experts with a keen interest in Elliott Wave Theory only; if you don't want to know how the engine works, just leave the hood closed! For traders looking to do stock picking (selecting stocks that are read to explode from a large universe of symbols), the Scan Inspector offers a unique way to filter out those symbols (be it actual stocks, curreny pairs or any other type of security). Because scanning in ELWAVE is based on the trading signals as displayed in the Summary Inspector window, you can scan for (fully customizable) criteria such as trend, reward, risk, riskreward etc. all based on the signals and targets derived from the automated Elliott Wave analysis. By scanning for criteria on multiple time frames (wave degrees) you can scan for, say, a 'wave 3 in a wave 3 in a wave 3', or simply for an uptrend in 3 consecutive time frames. Apply your own criteria for reward, risk and riskreward and you will have your own tailor-made trading setup scanner. For real-time traders we've taken the concept of scanning to the next level. Nobody enjoys watching their screen all day waiting for a possible trade. Our Realtime Alerts allow you to lean back and let your computer do the hard work. Simply setup the criteria and let ELWAVE monitor the market for you, alerting you only when an interesting trade comes along based on your own, fully customizable criteria for such things as reward, risk, riskreward etc. all based on the signals and targets derived from the automated Elliott Wave analysis. 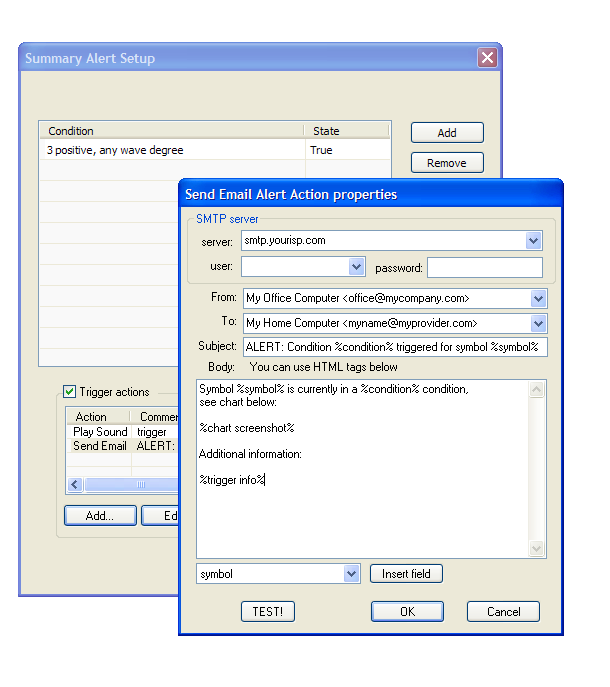 In fact, you can use the exact same 'scan conditions' from the Scanning module to define your Realtime Alerts. Of course you can also choose from a range of indicators such as Alligator, DSS Bressert, SMA, EMA, Ichimoku, MACD, RSI, Stochastic, TSI, Bollinger Bands, Keltner Channels, Parabolic, Elliott Oscillator, Stochastic, DMI/ADX, Awesome Oscillator and Accelerator. If that's not enought you can easily roll your own indicators in either C# or Visual Basic. ELWAVE consists of several fully integrated 'modules' so you can purchase a license for just those features that you actually need. Click here to get an instant price quote on any combination of modules.